Sunflowers and marigolds, with green and golden pears in white bowls and yellow and and white spotted and striped jugs. The large scale black and white charts are printed 10 stitches to an inch on two A3 sheets with key. 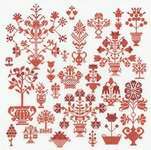 The pattern is worked in cross stitch and backstitch using 35 shades of stranded cottons on a stitch count of 207 by 85. See also Blue Flowers and Pots and Blue and Pink Flowers in Pots from the same series.